I’m not quite so scared now. I’ve got the looper up and running. I’ve figured out how to loop, record, overdub. I know how to save and name each project. I have constructed five separate loops to build one song. These are pre-recorded, then I can manipulate them and sing the top line over them. It works well and I now feel that like this, I could independently – after more practice – take it out for solo performances. I have yet to get myself sharp enough to record the loops live as I go. This requires a lot of concentration, coordination and practice. It would be good to be able to do that, as I think it does add another element to the live performance. But it isn’t crucial at the moment. I’ve been reading Sonia Boué’s account of her performances. They are very different to mine. She talks of the difference between acting and performance art and the nature of reality in each. I have yet to decide how performance fits with my work. I feel as if I’m still gathering data and skills. I feel I am collecting the ingredients and practising the craft. I am talking to an audience, weaving a story, attempting to deliver in a way that conveys emotion and enhances the narrative. I am still unsure whether the narrative is purely in the song, or whether I am more of a part of it. Am I presenting the art, or am I part of it? Am I a performance artist, or a singer songwriter? With the recordings done for Nine Women, it was easy to present the sound as part of the installation, it fitted in my head happily. The performance I did for the opening event was more a celebration of what had been done than a piece of performance art. Definitely singer songwriter, definitely not performance artist. I feel I have not yet collected enough data and ingredients, nor have I practised the skills enough, or done enough performing in order to be the performance artist. You know when a young student produces a drawing of a person, and then says “it’s like a Picasso” in order (so they think) to excuse the proportions and lack of skill? Well, I think, if I were to label what happened between me and an audience at the moment as “performance art”, it would be like that. Picasso had great skill and knowledge and chose from that great range of experience to paint how he did in later years. I am collecting what I need in order to make those decisions, and I’m not there yet. Where I am, actually, is brilliant. I am playing with my friends, I am learning from their experience. I am writing and singing and acquiring many new abilities… And lots of expensive equipment. I’m getting feedback and advice on technical stuff, and the musical elements, of which I know little. I feel like a sponge, soaking it all up. All the time, underground, the rhizomes grow and spread and make connections… And then, suddenly, under the right conditions, they sprout. Dan apologised for keeping the books for a while, but I found that because he had them, when they did return I could look at them with fresh eyes, and look more objectively at his comments. I had been worried that I couldn’t see a way forward. But actually, all the ingredients were there. I recall also, a chunk of Sonia Boué’s blog The Museum of Object Research dated 6th November 2014 – wow – a year ago! This short passage has stuck in my head. We rub off on each other, things rub off on us, and we rub off on things. We are intermingling around our edges. The materials of my work are fabric, thread, and found objects – made objects – the hand of the maker and appropriator evident in the work. That’s how I operate. 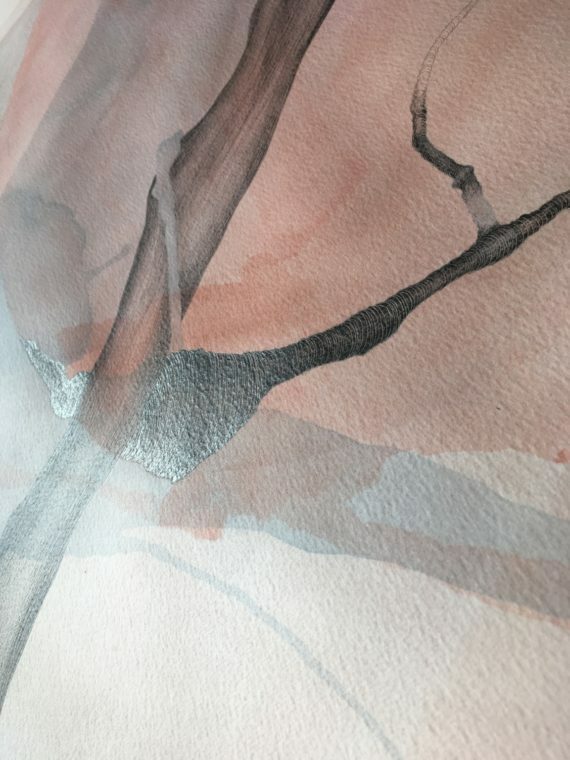 The concept is that rubbing off and on… The memory of the effect we have on each other… The permanence or impermanence of those effects, and how they are tempered by what happened before and after. The manner in which they come into being, my process, is that journey from “crazed frustration” (Dan’s expression) to a “State of Grace” (mine). This isn’t necessarily a total resolution, but a temporary, even fleeting, quieting of the soul. Having redefined, restated and reorganised these three factors, what the work actually might LOOK like is easier. I don’t know what I was worried about! The psychology of Elena Thomas is endlessly fascinating – to Elena Thomas at least. I spent an hour in Fair Deal Music this morning. I planned to buy a looper. I was meeting Dan for moral and technical support, but when I arrived he wasn’t there. This meant until he arrived I was stood in this alien land not knowing what to do with myself, my body, my eyes, my hands. So I played with my phone and lurked, embarrassed. If I could play an instrument I would have done. But I can’t. What good is a shop full of instruments to someone who can’t play them? 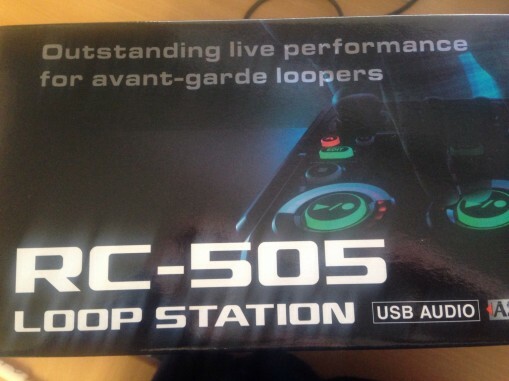 “For the Avant Garde looper” it says on the box, for those interested in the specifics). We had a go at a couple of alternatives, but actually they were designed as pedals for use by guitarists rather than vocalists. I didn’t want to use my feet, or bend down. I wanted buttons. Also, the flexibility of performance use for some of these things, for the type of thing I wanted to do, wasn’t really appropriate. There are all sorts of practical use, logistical and technical reasons for me choosing this model over others. Having said that, it was good to try the alternatives, even if only to confirm I had made the right choice. Ok… So I want this piece of kit. I want to use it to write songs, and I want to use it to perform with, on my own, as an alternative to playing with other musicians. It will be a different type of performance to those with a band. It gives me independence too. At the moment I have spent over £300 on a piece of kit, not knowing if I even have the capability to use it. You need really good timing, and good reflexes and responses. I have unpacked it, put it on a stand, and have done that task of wiring things together…. Looper to amp, looper to power, looper to microphone. Amp to power… Erm…. The lights light up. I press some buttons, other lights light up. So far so good. I take out the manual and discover that there are different settings, depending on which type of mic I use. At that point, I didn’t know. I have since learned that the mic I originally bought is a condenser mic, great for recording. The looper I’m told works best with a dynamic mic, with not such a wide frequency range as the condenser… ( I think that’s what he said). So, in the manner of the Elena Thomas known and loved, I unplugged everything and ran away. I did this when I bought my interface. I had about six abortive attempts to get it working on my own before I actually managed to get all the settings right… Input/output, speakers/ headphones…why the hell am I getting all that feedback? And then I still took a while to become comfortable using it habitually. So in the corner of my studio stands this new thing I’m scared of. Next time I will plug it in again, and get a little bit further in the process. Because I know which mic I’m using and now know it won’t blow up. A bit at a time, this shiny black box will become a familiar object. A bit at a time the shiny black box will become my friend. Eventually the shiny black box will become part of the practice, part of my studio landscape. But we’re not there yet. I circle it, looking at it out of the corner of my eye, I approach it warily. But then, on the other hand, there’s only so much courage I can muster. A girl needs a comfort blanket. Mr Jones can raise his eyebrows as much as he likes. It takes bravery to write lyrics that mean something. That initial start (for me anyway) takes something often quite visceral… personal… emotional… and puts it out there for all to see and hear. I am so fortunate to have the musicians around me that just take this and go with it. By the time it gets to ears further out, it has been mediated to some degree. Some might call this compromise I suppose. But I still know which bits are me. I keep my fingers crossed that no one spots me hiding in these songs. It took bravery for me to start reading these words as poetry to an audience. It has taken all that mustered personal determination to then start singing them, first in the songwriting circle, and then in the slightly wider world of the friendly audience. With these three guys: Andy Jenkins, Ian Sutherland and Dave Sutherland (no relation) I am protected a little as I contemplate tiptoeing out into a wider world. There has been talk of recording an album of these songs we write together. That I can cope with – bring it on! There is also talk, naturally among this lot, of performing them to real people, not just those invited special people, but people who may have walked in off the street and might not be at all kind to a fat middle aged woman who forgets the words. But I am determined to challenge myself in this way. I sing through metaphorical if not physical gritted teeth. The heart beats faster. I can never remember how these songs start, and there is always barely contained panic… And then I find the opening chords lead me to it and it is fine. The writing together is a challenge. But that gets the blood pumping too. I might have half a song of lyrics, or even a whole song, but as the music develops, sometimes they don’t scan well… I tend to write first drafts without much rhyme, and sometimes ignore metre too, wanting to get meaning clear. The challenge then is, while three musicians are trying out different chord progressions and time signatures and all that other musical science, I have to change it quickly, before that point where they all stop and look at me. I’m terrified they will stop and look at me, and I’ve got nothing! Adrenalin is my friend. Adrenalin is not my friend, because after these evening sessions, I stand little chance of getting to sleep before three, or staying asleep if I do! So, if you don’t mind, I shall take with me whatever comfort blanket I can find. Whether that is a sketchbook, an old bra, a girl’s summer dress… Or an actual blanket. I shall cling onto the corner fiercely, while pushing myself in uncomfortable directions. I passed my sketchbook on to Dan for him to look at and respond to a little while back. What this means is there is no cohesive way for me to pin down the ideas as they come into my head. After a scary few days when I felt like my mum had put my blanky in the washing machine, I think actually it is doing me good. Of course I am still able to make notes and sketches, it isn’t the only source of paper in my life. But the collection of scraps and thoughts on my desk is now less linear. I shuffle them about a bit now and then, or accidentally knock them onto the floor which enables me to see different connections. Also, the edge of the page is no longer a constraint. Or the colour of the paper, blah blah blah. I know that these shouldn’t be constraints even if I have a sketchbook, but in reality they are. I want to hand this book around a little. But who I give it to is a thorny issue. It is a thing of trust isn’t it, letting someone look through the foolishness contained within your sketchbook? Those half-baked ideas and stupid connections that fall apart at the slightest examination. You have to be sure the person understands how the sketchbook thing works. Dan is a writer. He understands the stream of consciousness thing, that gets rid of rubbish and occasionally yields a little gem of an idea. He also knows me and my work very well. So he is trustworthy and a safe pair of hands I’m sure. And this is the crux of the matter. My Blanky…. By only giving the book to people I already know well, who know my work well and who I trust implicitly, is it really any risk at all? Is it going to expand the thinking in the slightest? I’m not sure also, if the lack of the safety and comfort of my sketchbook has led me down a different path while I wait for it to come back. I’m writing more lyrics. The making of things with fabric and needle has pretty much stopped at the moment. But I’m thinking this is sort of apt too. I talk of the unfelt touch, the effect of one upon another. The belief that our edges cannot be seen with the naked eye….. 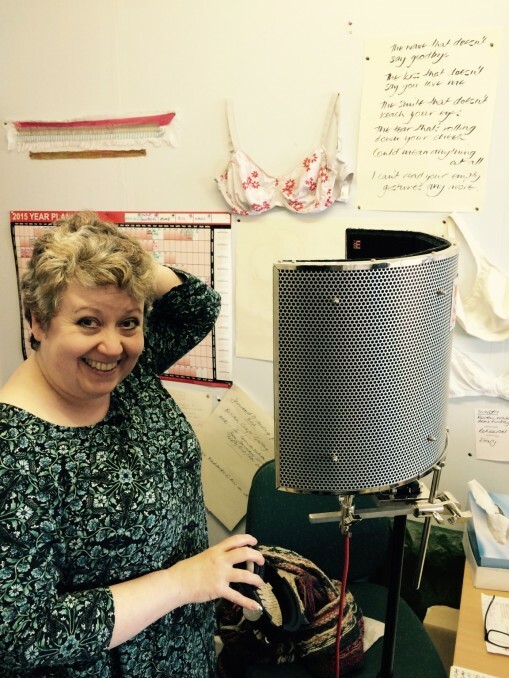 So instead of making something physical, I make a sound, a song, I weave and stitch the words and sounds instead. Their notes and notes can be pinned to paper as an aide memoire, but the real thing is the thing in the air that drifts in the space, caught by a different sense, taken away and spread unknowingly…. This should really be perfect for this body of work! And yet… I have stitched and made for so many years now that actually I am finding it hard to reconcile my creative thoughts to the not-stitched. So maybe giving my sketchbook a holiday, and disrupting my studio space are good excuses to allow me this adventure, and allow me to develop a few ideas to the point I feel confident they stand and are valid, without stitch.